Our Spines Can’t Define Us, No Matter What Degree! 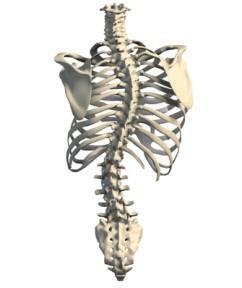 Lafayette Physical Therapy Blog Our Spines Can’t Define Us, No Matter What Degree! What is scoliosis? Do I need to be concerned about it? What’s the worst that could happen if I did nothing about it? Will it get worse over time? Can I do anything to make it better? These are some of the questions people often ask when they themselves, their child, a parent or friend are told that they have scoliosis. At first discovery, it can be kind of worrisome. However, at Lafayette Physical Therapy and Bay Area Physical Therapy, we have seen positive results by approaching the treatment and management of scoliosis in a holistic way, utilizing spinal elongation, breathing and strengthening/endurance/stretching exercises to improve lung volume and rib-cage pliability with spinal alignment corrections. There have been many scientific journals supporting specialized exercises for the management of scoliosis. Although there is not a cure for scoliosis, scoliosis curves can be reduced up to 32%. Pain can be reduced, lung capacity and chest expansion can be improved. Untreated scoliosis can progress up to 2.9 times more than those in a corrective exercise program. So, what exactly is scoliosis? It appears as the addition of lateral and rotational curvatures to the normal anterior (front) to posterior (back) curvatures of the spine. Scoliosis can be structural or functional. Functional scoliosis is a curvature that is less than 7% in the spine that can be corrected/reversible. It can result from things such as injury, pain, muscle spasm, leg length discrepancy or degenerative process of the spine. Structural scoliosis is different from functional scoliosis in that it is usually caused by congenital disorders, developmental process or of idiopathic origin (unknown cause). 85% of all scoliosis is idiopathic. Although, this type of curvature cannot be reversed like the functional type, it can definitely be managed to reduce pain and improve mobility and function. Generally speaking, if the scoliosis curvature progresses, it can start changing the shape of the rib cage, and as a result of this rotation, a “rib prominence” or “rib hump” will be noticeable. This can ultimately affect the amount and quality of lung volume and rib expansion in the normal breathing process of inhaling and exhaling. When this happens, the rib cage becomes more rigid and less mobile. If it becomes extremely severe at greater than 85 degrees, it can even collapse a lung. Gratefully, there is something that we can do about it. We can make positive changes in lung capacity and rib expansion with specialized therapeutic exercises and in turn, also improve the spine’s functional stability while decreasing the stress/tension on the of curvature on the spine. These Pilates-based muscle balancing exercises are focused on improving the quality of the breath to expand the more restricted parts of the rib cage, de-rotation/unwinding of the spine and correcting the convex and concave aspects of the spine. The spine can be propped and supported in order to create a better foundational symmetry to work on strengthening and stability. As a result, the improved stability and postural awareness can improve overall function in everyday life. Written by Kristal Evans, Physical Therapy Assistant at Bay Area Physical Therapy, sister company to Lafayette Physical Therapy, Inc.